The Yellow Shell Cottage offers oil fired central heating, 3 bedrooms sleeping 6 people, two bathrooms, a fine kitchen with all the modern conveniences, and tiled sitting room. The original doors and wooden floors give the bedrooms a lovely warm feel. A dryer and washing machine have been installed in the solid shed outside. 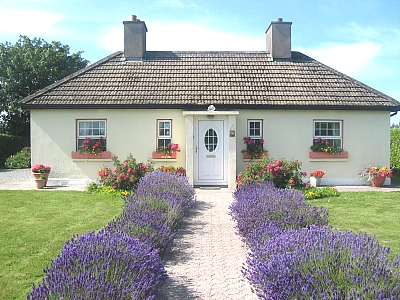 Within 5 minute's drive is the finest beach along the entire south coast of Ireland, two championship golf courses, scenic mountain roads and walks, and the bustling town of Dungarvan in Waterford County, Ireland. There is a nearby lovely and safe bike/walking path into Dungarvan Town or out to Clonea beach. You get everything in one comfortable location. The cottage has been totally modernized and extended since the days when a local farmer grew fruit and vegetables in the field and hung a big plaster shell - painted yellow - over the front door. Now its a really wonderful spot to base any Irish vacation.